From knoxpages.com, "...Tree removal is complete along the trail between Huffman Road and Johnsville Road (Ohio 314). Trees were cleared back from the trail as a maintenance measure to reduce root upheaval under the trail. Dead ash trees were also removed." From knoxpages.com, "...the Licking County Planning Commission has successfully applied for a grant to buy a 1.1-mile parcel that will connect two sections of trail: the Heart of Ohio Trail and the Meredith State Road Trail. From mountvernonnews.com, "...A ribbon-cutting ceremony was held Friday in Centerburg to open the two-mile section of trail from Clayton Street in Centerburg to Huffman Rd. "The newest section includes the pedestrian bridge over U.S. 36/Ohio 3, installed in september. "Knox county park district Director Lori Totman said the section from Huffman Road to the Delaware-Licking county line remains [to be completed]." The bikeway is now being paved on a new section that leads southwest out of Centerburg and toward the new overpass at U.S. 36/ Rt. 3. At the moment, we don't have any specifics regarding the exact length of this new trail section. Construction is underway to install a trail overpass over U.S. 36/ Ohio Rt. 3 southwest of Centerburg. 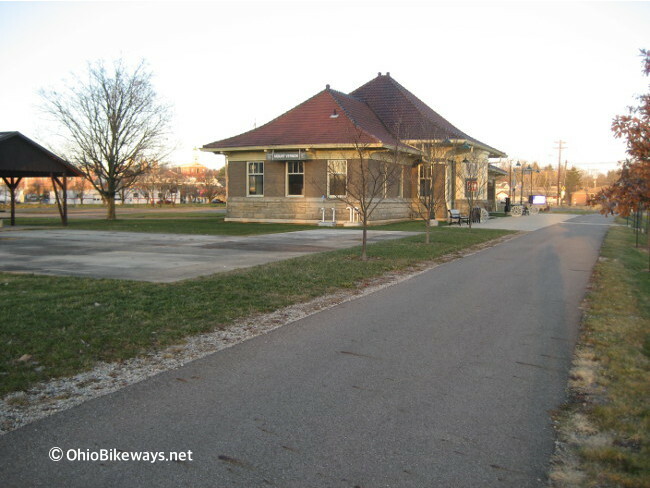 This will extend the Heart of Ohio Trail southwest to eventually connect with another segment of the Ohio-to-Erie Trail, a cross-state trail. According to the Delaware County Friends of the Trail group, the bikeway will be extended to the Delaware County line sometime in 2016. This extension should add about 3 miles of trail. Facilities: Restroom at Ariel-Foundation Park in Mt. Vernon. Porto-johns in Memorial Park in Centerburg. Water spigot just east of the band shell. Trailside shelter in Mt. Liberty. 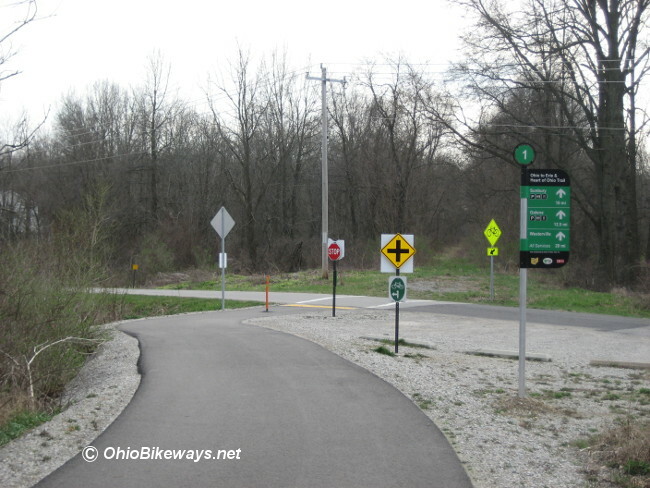 Worth Noting: This bikeway is part of the Ohio-to-Erie Trail. 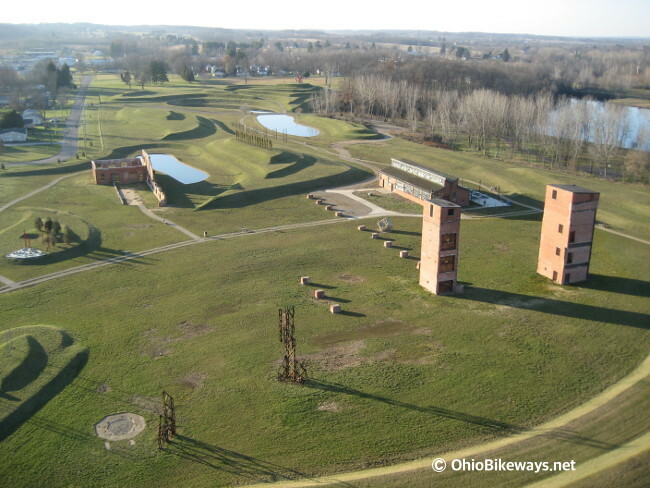 The Heart Of Ohio Trail opened in 2009 in an unpaved, natural state. Enough paving was completed in 2013 to add a smooth ribbon of asphalt to connect Centerburg with Mt. Liberty, Bangs and Mt. Vernon's westside. The newest segment, a 2.2-mile trail section, opened in December 2016. It connects the new trail overpass at U.S. 36/Ohio Rt. 3 with finished trail to the northeast and into Centerburg. This leaves only a ~1.3-mile unfinished segment southwest of the bridge and into Licking County to connect with the next segment of completed trail along the cross-state Ohio-to-Erie Trail route. Heading NE out of Centerburg and crossing Rt. 3, the paved trail slices through a crop field and adjoining property before it heads back into the cover of trees and brush. Much of the trail corridor is a lush, green ribbon, with occasional creekside views. The rebuilt bridge structures over the creeks along the route are first rate. They are made of concrete, which should far outlast their wooden-decked counterparts that become rough, uneven and even dangerous when not maintained properly. The paving contractor, Kokosing Construction, did a fine job. The total trail build here is impressive and top notch. Where the trail passes through Mt. Liberty, there's a small gravel parking lot with a trailside shelter. The structure, along with a bike rack and picnic table are nearby, courtesy of a local scout troop. Just outside of Mt. Vernon the trail moves alongside a drag strip where the trail appears to have been moved over slightly to accommodate the raceway. The trail moves into Mt. Vernon passing alongside Ariel Foundation Park. This park has become a community focal point and a unique trailside stop. The bikeway makes its junction with a Mt. Vernon downtown connector and the Kokosing Gap Trail after crossing Main Street (Rt. 13). The next phase will involve construction of a viaduct underpass along the Kokosing River here to avoid this multiple lane road crossing. But until that happens, a user-activated crossing signal helps trail users cross the busy street safely.